In reality, however, this “both sides complain” meme has operated as a fig leaf concealing just how far off the rails the mainstream news media have gone when it comes to reporting from the Middle East. In fact, journalists have, over the past two decades, actually produced an inversion of reality: not only do “facts” reported by Israelis get turned into an Israeli “narrative,” but Palestinian narratives get reported as facts. Some of this comes from pure intimidation. In 2014, during Operation Protective Edge, Hamas intimidation of journalists became so extensive that the Foreign Press Office, normally much quicker to denounce Israeli intimidation than Palestinian, issued a protest against Hamas’ behavior. In 119 characters, she dismissed ample empirical evidence and credible testimony of Hamas intimidation as an “Israeli narrative,” now also adhered to by the FPA, and instead gave us the Palestinian narrative as news. In other words, the real nonsense comes across as the reporter’s voice, and the accurate assessment comes across as Israeli narrative nonsense. The Labour Party brings to mind any number of Yiddish expressions — most of them involving the performance of lavatorial functions — but none more so than the proverb Der mentsh trakht un Got lakht. Man plans and God laughs. The Almighty’s black humour is surely at work in the resignation of Christine Shawcroft, chair of the Labour Party disputes panel. The woman responsible for rooting out anti-Semitism has been caught defending a council candidate accused of posting Holocaust-denying content on social media. In a leaked internal email, Shawcroft called for Peterborough’s Alan Bull to be reinstated after suspension for ‘a Facebook post taken completely out of context and alleged to show anti-Semitism’. One of Bull’s alleged posts read ‘International Red Cross report confirms the Holocaust of six million Jews is a hoax’ and a link to a neo-fascist website, Renegade Tribune. Bull insists screenshots of his Facebook page have been doctored. The Renegade Tribune has reported his plight under the headline: ‘UK Labour Candidate Shared Holohoax Article from Renegade Tribune, Suspended by Party’. Shawcroft was put in charge of the disputes panel just 71 days ago, after the far-left ousted Ann Black, who is herself a left-winger but had seemingly displeased her comrades with her handling of membership rules and suspensions for, among other things, anti-Semitism. Her resignation, and the fact it came about via the leaking of an email sent only to fellow far-leftists, is being spun as proof that there is now an appetite among some Corbynistas for tackling Labour anti-Semitism. Undoubtedly, they are a ruthless, power-hungry bunch who make New Labour look positively unambitious by comparison. They would surely say or do or feign anything to get into Downing Street. Asked on Sky News this morning, John McDonnell would not say whether Shawcroft should also recuse herself from her NEC seat. (He later said she shouldn’t step down). I hate to be a pain but it’s been three days now. Three days since Jeremy Corbyn acknowledged ‘pockets of anti-Semitism’ in the Labour Party and pledged himself as a ‘militant opponent’ of Jew-hatred. What has happened since then? Apart from Labour’s anti-anti-Semitism chief quitting after defending an accused anti-Semite, the answer seems to be nothing much. Richard Angell, head of the centrist pressure group Progress, has suggested a programme of actions to take on Labour anti-Semitism. Wes Streeting and John Mann have done likewise. Indeed, there seem to be more plans for ridding Labour of Jew-hatred than there are figures at the top of the party with any interest in or motivation to adopt them. After the throwing of a hand grenade at the Masuda Shem Tov synagogue on January 14, 1951, during the registration of the Jews of Iraq to immigrate to Israel, three people were killed, six were seriously injured and 19 were lightly injured. Since the Iraqi government was not quick to publicize its findings, a malicious rumor spread that the Zionist movement had done the utmost to expedite the departure of the Jews from Iraq.The accusation of serious misconduct in the Zionist movement harmed its members and its head, Mordechai Ben-Porat. For years he fought to clear the name of the Zionist movement and his own name, including in a libel suit in court, and hoped to expose the truth about the affair. Mordechai Ben-Porat's autobiographical book, "From the Land of Birth to a Homeland" (published by Teper), now has new evidence about the grenade shells lobbed at the synagogue and a cafe where young Jews used to gather. The testimony is included in the book "History of the Zionist Movement in Iraq and Its Role in the Immigration of Jews in 1950-1951", published in Iraq in 2013, which includes the research of the historian Shamel Abd al-Qader.The study includes a video of the culprit and his partner saying that they threw the grenades, directed by the national poet Adnan al-Ravi, a leader of the nationalist Al-Istiqlal party, which worked to expel the Jews from Iraq. Thus, Mordechai Ben-Porat, when he reached a ripe old age, received direct testimony from the perpetrators of the crime, who of course were not punished. Today the Jews of Iraq are happy not to live in bloodied Iraq, where they lived since they were exiled to it with the destruction of the First Temple in 586 BCE. The highlight of Mordechai Ben-Porat's public activity is, of course, his secret mission to Baghdad and the organization of Operation Ezra and Nehemiah, together with Shlomo Hillel, in which some 110,000 Iraqi Jews immigrated to Israel.The huge operation was conducted without a hitch, until the hand grenade was thrown at the synagogue, which was the last stop on the way to the airport. Israellycool contributor Kay Wilson relives the day she was left for dead by palestinian terrorists – while her friend was murdered. As Kay writes: I just watched my own attempted murder on television. “Surreal” doesn’t even cover it. Kay is quite simply one of the most remarkable people I know, and I am honored to call her a friend. 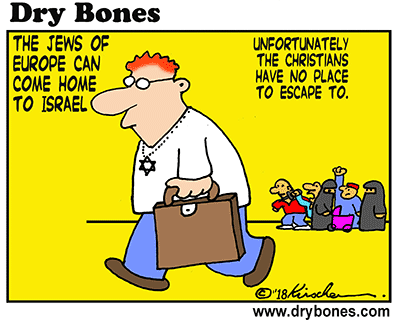 But you cannot help getting sick – you can, however, help turning a blind eye to antisemitism. Corbyn made his own choices about what he clicked online and who he had tea with. What Jewish people need is for him to take some responsibility, show some backbone and honesty, explain why he was willing to ignore antisemitism for so long, and apologise. Not for “feelings hurt”, but for endorsing racists. But I’ll be honest, I’m not holding my breath. So in the meantime, going to the protest was a balm. It was a relief to be with people who weren’t gaslighting Jews by insisting that what they were seeing in front of their eyes wasn’t true, and it was nice to see the MPs who showed up – Harriet Harman, Jess Phillips, Stella Creasy, Chuka Umunna – and know that at least some Labour politicians weren’t laughing this off as a distraction. As MPs go into the Easter recess, Jeremy Corbyn is rounding up one of his worst weeks as leader yet. After the Board of Deputies of British Jews and the Jewish Leadership Council wrote to the Labour leader accusing him of ‘again and again’ siding with ‘anti-Semites rather than Jews’, both members of the Jewish community and Labour moderates attended a demonstration in Parliament Square to voice their concerns. Only some of Corbyn’s more dedicated supporters weren’t having any of that and staged a rival protest defending their leader from ‘MSM smears’. JN: There have been calls for David Lammy to be deselected in Tottenham because he turned out to support the rally against anti-Semitism. Again will you make it clear that you don’t want anyone deselected…? JC: It’s up to the local party… but not for that, no. Obviously the local parties must decide what they want to do in the future. David Lammy is a colleague, a friend of mine, I admire what he stands for and what he does and he should not be condemned for that. British Labour lawmakers who participated in a protest rally that criticized leader Jeremy Corbyn for failing to deal with anti-Semitism in his party have been slammed by party members, some of whom have called for them to be removed from office. During Monday’s event, around 1,500 protesters massed outside the British parliament. It was an unprecedented rally organized by the usually publicity-averse Anglo-Jewish leadership, and attendees bore signs reading “No to anti-Semitism,” as pressure ramped up on the party and its leader. The Corbyn-backing blog Skwakbox emailed five Labour MPs who were at the rally demanding to know what actions they had taken against other forms of racism, in what was seen as a suggestion that their participation was political rather than principled. In response, over 40 MPs and political figures published an open letter Tuesday on the Huffington Post website accusing Skwakbox of bullying those who took part in the protest. Grim stuff from the leader of a mainstream political party. A senior official in the UK Labour Party resigned Wednesday night after it emerged that she had called for reinstating a local council candidate who had been suspended from the party for sharing on Facebook an article that claimed the Holocaust was a hoax. When news of her stance came out, Shawcroft apologized and resigned from her position on the panel. However, she has not stepped down from the party’s National Executive Committee, or from the party itself, despite calls to do so. 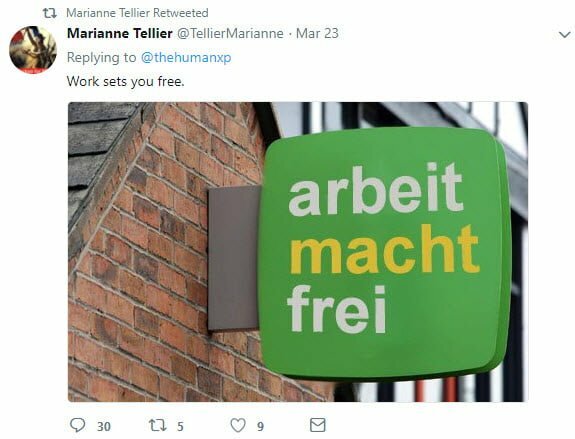 With all the vile antisemitism in the UK Labour party coming to light over the past months, Marianne Teller, the Labour Party secretary in Park and Arbourthorne, has somehow seen it fit to not only tweet this days ago, but retweet it today. I do not believe this is mere stupidity like this; I think she fully knows what she tweeted and is trolling those who are appalled by antisemitism. A bipartisan group of congressmen and senators has agreed on revisions to a bill targeting the Boycott, Divest and Sanctions movement against Israel, hoping to alleviate concerns that their first draft infringed on free speech protections. The bill, the Israel Anti-Boycott Act, was drafted in 2017 as a response to a decision by the United Nations Human Rights Council to blacklist companies operating in the Palestinian territories, defined by that body as all territory beyond the pre-1967 war Green Line. If passed, this bill would amend the Export Administration Act of 1979 – originally written to protect US companies from Arab League sanctions on Israel – to shield Israel and Israeli businesses from international boycotts of virtually any kind. Specifically, the legislation would criminally penalize US persons seeking to collect information on another party’s relationship with Israel in pursuance of a boycott. But the American Civil Liberties Union – an NGO at the forefront of several battles against the Trump administration over the rights of immigrants, refugees and minority groups facing systemic discrimination – has said the bill would make worse the 1970s-era law, which in its view had already stymied the ability of individuals and companies to exercise their constitutional right to boycott. Democratic drafters of the bill, including Sen. Ben Cardin of Maryland and Rep. Juan Vargas of California, worked with the ACLU to assuage its concerns. The Boycott, Divestment and Sanctions movement for the first time officially called on Wednesday to boycott Israeli hit TV series Fauda (Arabic for “Chaos”) and remove it from Netflix. In a letter to Netflix, BDS claimed that the Israeli political thriller shows “racist propaganda material for the Israeli occupation army and [is] hostile to our people and its liberation process. “The series promotes and legitimizes the war crimes committed by death squads disguised as people pretending to be Arabs within the occupation army,” the letter continued, referring to a unit in the IDF which specializes in undercover operations in the West Bank. Fauda, a Yes satellite-network show that dramatizes the Israeli-Palestinian conflict and Israeli intelligence efforts, has seen huge success and broke a record by taking home 11 prizes at the Israeli Academy for Film and Television awards in March. The Hebrew/Arabic series has also become a worldwide phenomenon and won international acclaim when it was picked up by Netflix, where it can be seen with subtitles in English and many other languages. The letter from the BDS movement called on Netflix to “stop broadcasting and not to produce the third season of the series and remove the previous seasons,” citing racism against Arabs and encouragement to violate international law and human rights as a reason. Not taking the hit series down could “expose Netflix to legal prosecution,” the letter warned. Misrepresentation of Jesus as a Palestinian has long been seen in the Palestinian media and that politically motivated historical revisionism is sanctioned and propagated by the Palestinian Authority and members of its dominant party Fatah. Those watching BBC One’s faith and ethics debate show ‘The Big Questions’ on March 25th may however have been surprised to see that ahistorical notion go completely unchallenged during a discussion (available in the UK here) titled “Would Jesus be labelled an extremist today?”. Presenter Nicky Campbell responded to that claim with one word: “exactly”. Huffington Post Arabic Removes Scare Quotes from "Israel"
In response to communication from CAMERA Arabic, Huffington Post Arabic removed scare quotes which had appeared around a passing reference to Israel. In a March 10 post ("Status of Syrian women ranks worst among area states"), Syrian blogger Ragheb Bakresh discussed the status of women in various countries around the world. CAMERA Arabic flagged Bakresh's unique treatment of Israel, in which the blogger placed scare quotes only around Israel, stating: "And the occupied Palestinian territories were included in the framework of 'Israel.'" It is highly ironic that the blogger originates from a country which, in the last seven years, has been devastated and torn apart by civilian war to such a great degree that it is even questionable as to whether Syria constitutes a sovereign country. Nevertheless, Bakresh, as if dreaming of Israel's disappearance with a single stroke, tapped into the old Arab refusal to recognize the reality on the ground and used scare quotes to refer to Israel. Moreover, Bakresh's position is contrary to the current widespread Arab consensus which accepts Israel's existence. In response to CAMERA Arabic's correspondence with Huffington Post Arabic, editors commendably removed the scare quotes from Israel's name. Lawmakers and local Jewish leaders who met over breakfast with Trayon White Sr. said the Washington, DC, councilman was sincere in his apology for suggesting on Facebook that rich Jews control the weather. Council Chairman Phil Mendelson called Tuesday’s meeting, which included bagels and lox from a local kosher market, “an opportunity for us to learn better about different aspects about bigotry, racism and anti-Semitism,” the Washington Post reported. The meeting, which included about 20 Jewish leaders, was organized by Mendelson and Rabbi Batya Glazer, government liaison for the Jewish Community Relations Council of Greater Washington. “Growing up as a young man in Ward 8, I had no idea what anti-Semitism was. Really. As a leader, I should be held accountable,” he said. The service had been supported in Hebrew within Israel by displaying locations on maps. Now the entire service is available in Hebrew for major locations worldwide. Google's web mapping service Google Maps is now fully supported in Hebrew. Yesterday Google announced that it was launching the service in 39 additional languages including Hebrew. Google Maps is now fully available on both mobile apps and web browsers. To date the service had been supported in Hebrew within Israel by displaying the names of locations on maps in Hebrew. Now the entire service is available in Hebrew including major locations worldwide, if the user so requires. In February Google added 18 languages to its Google Assistant service including Arabic. Hebrew has yet to be launched.